S.H., to my mind, has gotten a bad rap as being akin to selfishness. Me, I favour Abraham Maslow’s understanding of self-help – which is in order to “self-actualize” – to become all we are meant to be – we need to have certain needs met. Thus the understanding of this S.H. section is that when we have achieved some degree of wellness ourselves, we can work with others to help in their healing. In helping ourselves, we help ourselves – provide self-help! The pictoral theme of this section is animals (including human animals) helping each other. I encourage you to get an accountability partner (also known as a friend) and do all of these S. H. exercises systematically - one per week. 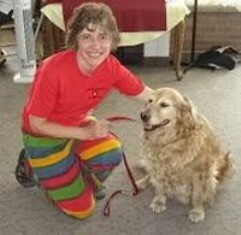 By the end of one week you will have had the equivalent of nine to ten sessions of counseling. At a rate of, let's say, $75 per hour times two people, you've just saved yourselves $1500.00! I feel very strongly that any person who embarks on becoming a counselor needs to have in-depth counseling over a period of time in order to discover and incorporate her or his dimples and warts. And I maintain that counselors should see a counselor at least twice a year - usually more. By doing this they we will not be as tempted to bring our own problems and resolutions into the counseling appointments of others. Here is a list of S.H. techniques and exercises many have found helpful. I hope you do too. You will find them all on the navbars to the left. 8. Goal-Setting and Achievement – where do we really want to go? 9. Finding "The Why" in Order to Bear "The How"
10. How to Be the Happiest, Healthiest Person You Can Be! Maslow has set up a hierarchy of five levels of basic needs. Beyond these needs, higher levels of needs exist. These include needs for understanding, esthetic appreciation and purely spiritual needs. In the levels of the five basic needs, the person does not feel the second need until the demands of the first have been satisfied, nor the third until the second has been satisfied, and so on. Maslow's basic needs are as follows: physiological, safety, belongingness, esteem and self-actualization. These are biological needs. They consist of needs for oxygen, food, water, and a relatively constant body temperature. They are the strongest needs because if a person were deprived of all needs, the physiological ones would come first in the person's search for satisfaction. When all of the foregoing needs are satisfied, then and only then are the needs for self-actualization activated. Maslow describes self-actualization as a person's need to be and do that which the person was "born to do." "A musician must make music, an artist must paint, and a poet must write." These needs make themselves felt in signs of restlessness. The person feels on edge, tense, lacking something, in short, restless. If a person is hungry, unsafe, not loved or accepted, or lacking self-esteem, it is very easy to know what the person is restless about. It is not always clear what a person wants when there is a need for self-actualization. 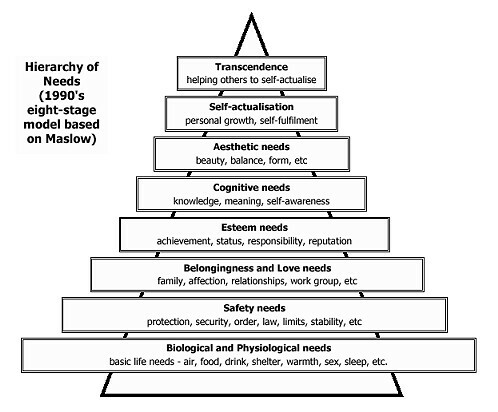 Later in his life, Maslow came to decide self-actualization was not the highest level of development, and proposed that people who have reached self-actualization will sometimes experience a state he referred to as "transcendence," in which they become aware of not only their own fullest potential, but the fullest potential of human beings at large. "The Third Force: The Psychology of Abraham Maslow" by Frank G Goble, 2004"